Mixing Electric guitars is very much a matter of ‘form fits function’. I first have to decide the placement and the function of the guitar in the track. Let me give you a few examples. When I mix an Eddie Van Halen guitar solo, I like a blend of delay and doubling/harmonizer and possibly a delayed reverb. First, I like to take two dedicated mono delays and pan them left and right. These can be a bit lo-fi and not particularly hi-fi, so I like to use the GTR Stomp delay for this. A delay of 400 ms left and 800 ms right is a good start. You do not want to time the delay for these since you want these to stand out a little. Then I will also blend in a slight 7-up/7-down harmonizer with a slight 55 ms / 75 ms left/right widening. I will also blend in a timed 1/4 note to add a bit of depth. 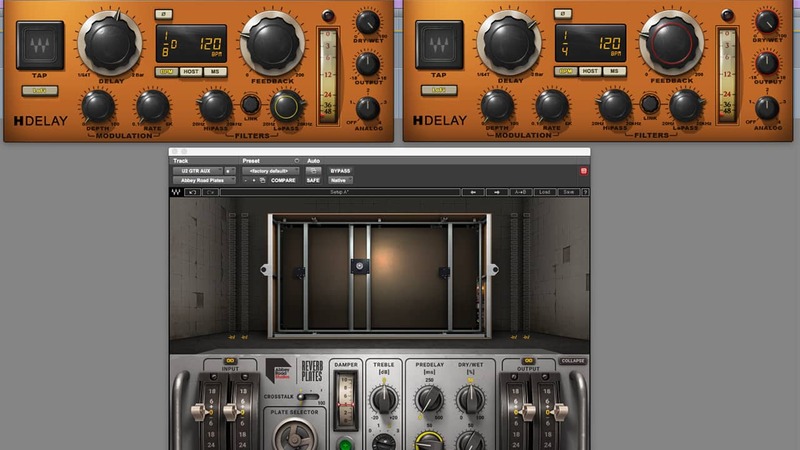 On the H-Delay I often put in Lo Fi mode for a darker sound, and I also high-pass and low-pass it to narrow the response. Delayed reverb is something that often works too, if you want to soften your delays and add a nice depth to the delay bounce. I use a dedicated left and right delay again but this time I actually time one to a dotted 1/8 and time another to a 1/4 note and then feed these returns into a plate reverb such as the Abbey Road Reverb Plates. Again, you will see that I turn on Lo Fi on the delay and band pass the delay to limit the delay’s frequency response to taste. Sometimes while mixing specific guitar parts on a record, I may decide to really alter the tone of the guitar given to me. This is when I may pile up a stompbox row of effects in GTR as I might on the floor of the studio. Distorted wah-wah is a favorite of mine. When mixing heavier rhythm guitars, something that works nicely for me is the Kramer HLS into CLA-3A. This comes from my analog days: basically, this is a Helios channel into an LA3A. The magic of the EQ happens when you kick in the 60 Hz boost but do not actually add boost on the boost knob. Just kicking in the circuit creates a magical low-end bump. Then you band-pass the top end by cutting 10 k by maybe 4 dB to start, and then get aggressive with adding the midrange to pop out the frequency to taste. I follow with the CLA-3A to pull it all together. I really like the combo of these plugins when I want the guitar to really pop out. 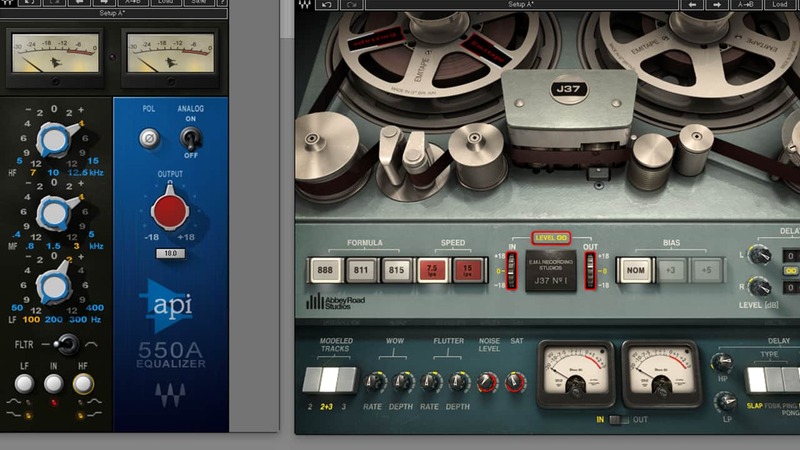 A recent favorite of mine is the J37 Tape plugin. You can try putting this on any guitar track to make it more realistic and energetic, along with adding an API EQ and possibly even add some doubling on the delay side of the J37. The tape and speed settings really make a difference. For a special moving panning delay, I recently created a combo of the J37 as a delay into the Brauer Motion. This combo makes the delay bounce and pan around the mix. I find this a special way to make the delay hide and go seek in the track for longer solos or guitar swells. I have been doing this in analog mixes for years by sending the delay into a panner. With the Brauer Motion you now have an incredible tool for creativity. I generally record real amps but I think it’s a good discipline to record a DI with every guitar and bass track (you can always get rid of them later if you don’t need them). 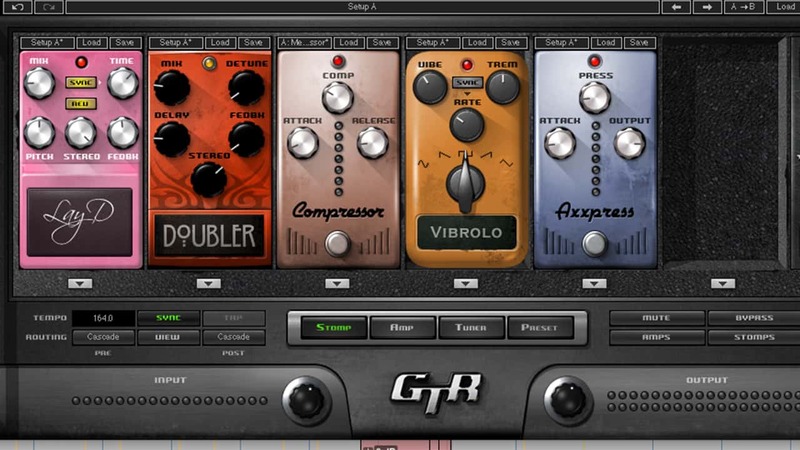 The GTR3 pack includes great tools for re-amping or enhancing any guitar tones. 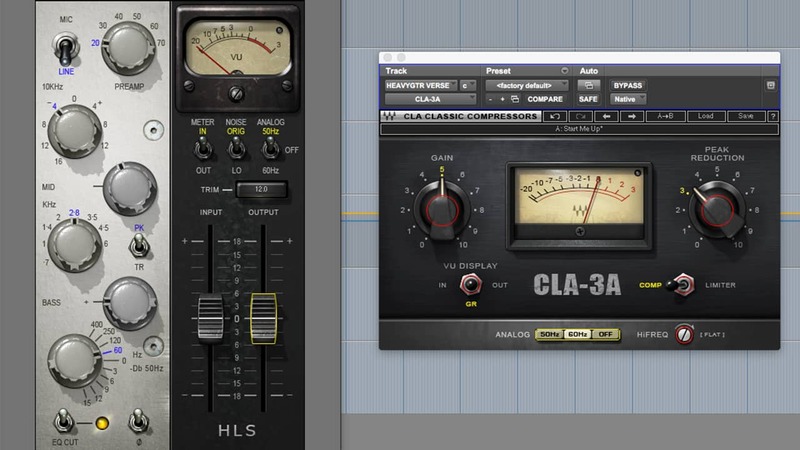 I love the CLA Classic Compressors for the way it evens out dynamics on guitars. For more sustained or distorted electric guitars, the CLA-3A at 2 to 5 dB of gain reduction, with the HiFREQ knob pulled back to 40 or 50, really tightens the sound. For faster, more transient guitars, you can’t go wrong with the Blackface CLA-76. Most of the time I’m using a 4:1 ratio with my release set to 7 and attack on 3 to 4. Once again 2 to 5 dB of gain reduction is enough. For a bit more extreme compression I really like the Renaissance Axx on guitars. For me, it somehow ‘centers’ the sound and really controls the dynamic. It is great for solo guitars. It’s also an ideal plugin for managing an overly dynamic acoustic guitar in a mix. I like using a 4x12 guitar cab when recording a bass, but if I don’t have one available the GTR3 works perfectly. A setting such as OverBass with the ACME 12-inch open back is great to get the mid-range push. I start with the drive all the way up, the bass all the way down and adjust mids to taste. Sometimes if I want to filth up a bass and give it more fuzz, I like to insert GTR Stomp over the DI, have the Buzz Pedal on with the tone around 2 o’clock, and then put the Bass Pitcher after it with a low octave and the mix on 20. I will use this channel to mix in with the other mics and DI. And of course, if you want to add extra weight, Renaissance Bass is a go-to plugin. I normally use an intensity of 5 to 7, with the frequency slider set depending on what suits. Using the Renaissance EQ6, I can re-voice the direct guitar for re-amping with either a plugin amp simulator or an amplifier. I have a preset with 4 of the 6 bands activated – a high pass filter, 2 peak bands, and a low pass filter. With this plugin, I can adjust the amount of bottom end, the midrange bark and pick scraping of a guitar that sounds very different from post-amp equalization. I’ve used this method of re-voicing/re-amping very successfully for Pink's track “Misery” off the Missundaztood album. I recorded Richie Sambora for the solo starting at 2:50 and he did a great job (plus he's hilariously fun to work with). It's an awesome solo but it felt it could use 'something.' So, I wrote automation to an EQ peak band with a lot of boost, and moved the EQ band's center frequency so it felt very much like a wah pedal. That direct signal was fed back out to an amp and it's very convincing and satisfying. In trying to get thick-bodied guitar sounds, quite often a boost in the bottom end is needed close to the guitar cabinet's (real or emulated) resonant frequency. So, open chords sound substantial and meaty but palm mutes may have way too much bottom end and sound woofy. The F6 dynamic EQ is the tool for such a situation. Take a look at the screen capture as an example. Go to an open chording part of the song and adjust the low-end EQ to taste. Then, set the threshold to trigger only when tight chording/palm muting occurs. 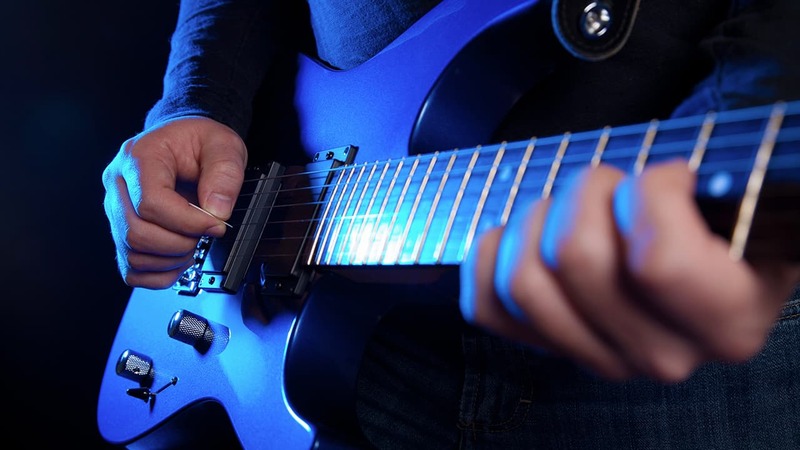 Setting the range control negative and adjusting the amount of negative range to clear up the bottom end will yield a heavy open chord sound and a tight clear djent-type tone. Sometimes it can take a while to find the right sound for a song. For electric guitars, it’s about experimentation and listening to the amp. The beauty with GTR3 or any amp sim is you can change this later. I personally feel it’s best in combination with a physical amp, but I’ve used Waves GTR as the main source sound many times. With a physical amp, you can achieve a great sound with as little as the humble Shure SM57. You might close-mic the 57, point at the center of the speaker to get a bright sound, and shift it further to the edge to get something more mellow. Meanwhile, you can use the condenser to capture the direct and room sound. Depending what type of room you’re in, mic distance will vary so start with a few feet and listen. Keep in mind any distance between the mic’s can cause phase problems by cancelation of certain frequencies. this can be improved with phase alignment later if needs be, InPhase can be fantastic for this, but I prefer to get a blend that’s nice to record with. It’s easy to hear the tone change with phase problems. Go into the recording room and listen to the sound of the amp, it should sound fantastic. Then go back into the studio and your mic blend should sound as good if not better! Is it missing bass end or brightness? Then move the mic’s or check your mic balance. Mic choice is key when re-amping in the box, too, and GTR gives you a good choice of dynamic, ribbon and condenser mic’s, so don’t overlook changing them. After all, they can dictate a lot of the tone. A dynamic in combination with a large diaphragm condenser mic can give you a wealth of sound options due to their wider frequency response, especially for bottom end. And don’t forget the choice of mic positions as you would with a physical cabinet. When recording DI, make sure your using a Hi-Z input on your interface, and keep the latency low, not to affect the playing. I generally take the guitar signal after the pedals to the DI, but if the pedals are adding anything extreme you may want to remove later. If in doubt, split the input before the pedals. Keep tracking simple, with a little bit of subtractive EQ, an old-style reverb and a tape delay. Good tone and simple processing will help latency and help you get the performance without overdoing it with lots of FX. Once you’ve captured the performance you can start layering different guitar sounds, doubling parts, adding effects or re-amping within your DAW to create wide stereo walls of guitar sound. 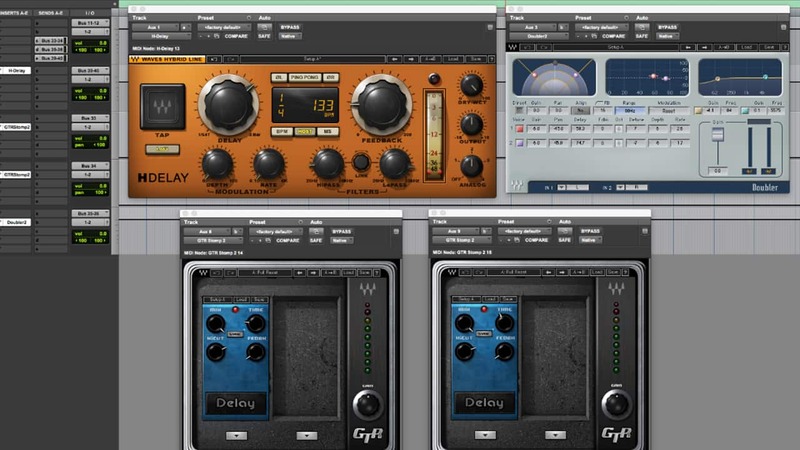 Try adding or reducing gain into Waves GTR via a gain plugin on your guitar DI channel. It can help a lot when trying to get a high gain lead sound that’s just not catching the right sustain. When mixing I might use more subtle effects on guitars, stereo delays, a mild chorus like Dimension D/Logic Ensemble, or the Waves Doubler to enhance a bit of the stereo spread. Panning guitars can be tricky to get right. Although there should be no rule in mixing, be careful when hard panning guitars. I seldom do it as they can sit outside the mix, so the trick is to get them not too narrow but not too wide. If you have a mono guitar part that’s taking up a lot of room, try a mono reverb and pan it with the guitar. You can also turn a single guitar into stereo: the classic option is to delay a copy of the guitar to the opposite side, but you have to be careful again with width and length of delay – 8-10 ms should be enough. 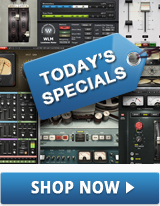 For best stereo effects on a mono guitar, try the Waves Reel ADT or use the J37 Tape rather than a digital delay. 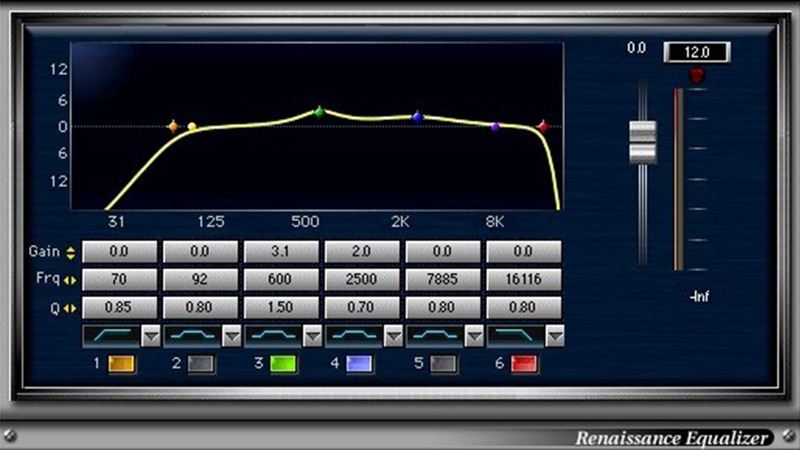 The saturation and tonal change can help enhance the L/R difference to the stereo effect. One speaker might sound better than another in a 4-speaker cab! Choose the best when placing the mic. Ensure you have new strings and that the guitar is in good condition! Check tuning before each take! Feed a tuner from an aux or via split so it’s always on. Amp tubes/speakers are good: no popping, microphonic ringing or hissing. Pointing the mic at an angle so that it’s less direct can reduce brightness and provide alternative tonal character. Try facing the cabinet into a corner and mike from the rear for less bass, or lift it from the ground. You don’t always need a big amp! Experiment with mic position and try to blend two mic’s before you use EQ. Use two alternate amps combined for blending mellow and bright. 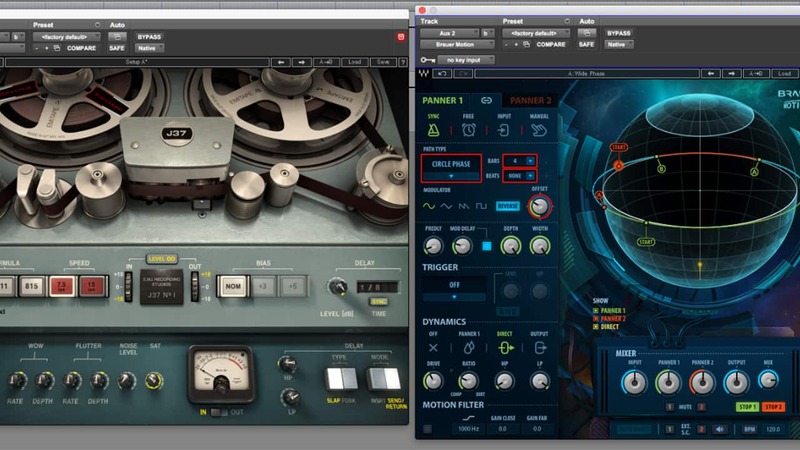 Record a separate DI feed for re-amping (great for blending). I could go on & on with guitar tips, taping down strings that are not played, sending the signal to a pair of overdriven headphones and micing that up for crazy re-amping, creating random feedback noises by screaming into the guitar pickups in front of a speaker etc. etc. – but the best advice is experiment and have fun! You don’t need a huge amp to make a huge sound. Small amps are convenient and easier to control. Unlike on stage where you want the sound to carry several feet, in the studio a smaller speaker close mic’d can be much more effective as the should is not going to overwhelm your best mics and you will actually be able to hear what you’re recording rather than that big noise in the room – often it’s a disappointment that what felt great standing next to an AC30 on full tilt doesn’t translate in the mix. The small ones can still squeal. I love Champs, Skylarks, and my beloved Lazy J. But also try those toy battery amps with a 57 taped to it and turned up all the way. Break every rule you have read about the perfect x-marked spot on the grille. How many times I have wanted to scream when I see engineers get out torches to look for the center of a speaker and compasses to measure the angles. Arrggghhh! My fave sounds are the ones where you stick up any mic in the room and go with it. I always have an amp by my setup with an 87 or Coles 4038 a few inches away, but I also always have a vocal mic about 4 feet away in the room, and that one ends up being used more often than the close one. Forget the 6 mics doing that geeky shootout you will post on the Tube and feel really ‘pro’ about. You’re supposed to be making people fall in love, dance, cry, not scratch their chins and send you a ‘like’. I stick up the nearest mic to me. If there’s something wrong, my first question is “well, what are you playing? Maybe it’s not very good.”It would take a lot for me to care about switching mics. I would have to be playing pretty bad! DIs were good enough for Motown… so is there any other argument? Try going through a nasally fuzz on the way to the DI, then dial in some 2.5k and sound like Ron Isley. Try completely distorting your mic pre. Try doing everything wrong. Try this: a clean funky rhythmic DI part through an MXR red compressor, then doubled identically and hard panned. If I ever record more than one mic, I like to have the room panned 60 degrees and the close mic just off center. Try flipping the phase after. It might be out and still sound better. Acoustics make great secret rhythm guitars. Maybe a couple of different ones slammed and dirty right behind the electric rhythm part. Try getting the singer to bash along on a semi acoustic with the vocal mic picking up all the brash high frequencies. Group your guitars according to parts onto auxes. Ask yourself did you really need that 3rd double in the end? Can you get rid of a few mics and harmonies now? Can you group all the rhythm parts to one aux and process them together as a stereo? Remember that everything changes in the mix buildup and mostly you need to keep bringing that guitar into focus. I love the J37 tape saturation plugin for the little delay, the modulation and the saturation. Puts it back into the room. Don’t look at your EQ curves, just listen. It’s guitar! You can make it sound like anything. 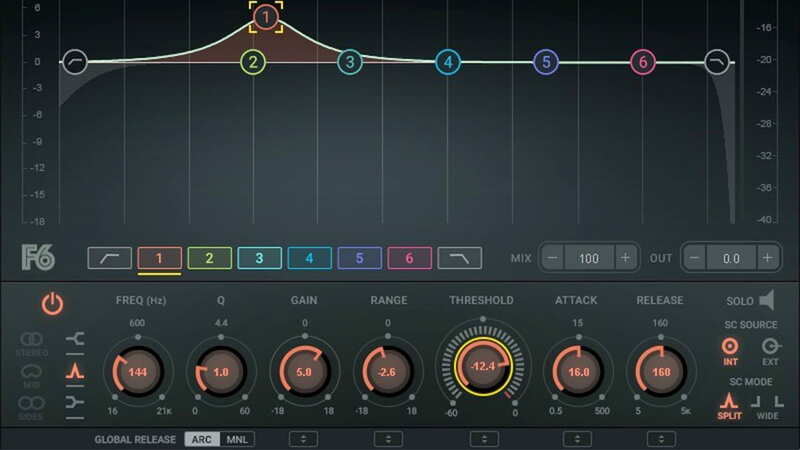 The Waves Renaissance EQ is great for sculpting, but the V-EQs are where you beef up the bottom and overload the nasty mid range. Stick a CLA-2A at the end to calm it down.